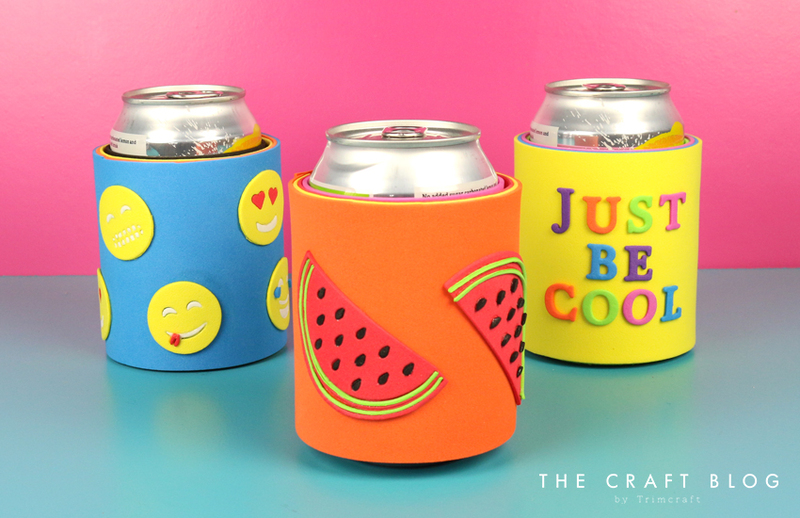 Not only are you going to stay cool but you’re definitely going to look cool as Claire shows you how to give your fizzy drinks a funky look with these awesome foam can wraps! 1. Begin by cutting down a piece of Dovecraft A4 pink foam down to 22.5cm x 9cm. Wrap the foam around your can, stick together with Dovecraft Perma Fix tape, ensuring the can slips out easily. 2. Next cut 3 different coloured A4 foam sheets down to 23.5cm x 9cm, stick and layer together. 3. Cut a 9cm x 2cm piece of orange foam. Wrap your layered pieces of foam around your can. Secure the layers by adding double sided tape to the back of the 9cm x 2cm piece of foam and placing it on top of the gap on your wrap, ensuring it overlaps the two sides of the layered foam. 4. Next, decorate the front of your can wrap by die cutting the watermelon die from the First Edition Tropical dies set twice onto red, green and black foam. Use the green and black cut outs to fill in the watermelon die cuts. Glue your watermelon die cuts at an angle, to the front of your wrap. How refreshing is this fruity design? You could also die cut a summery sentiment or die cut the First Edition Emoticon dies to add character to your can wraps! How will you decorate your cans? We’d love to see so don’t forget to #trimcraft when uploading to social media and to share your makes in the Inspiration area!